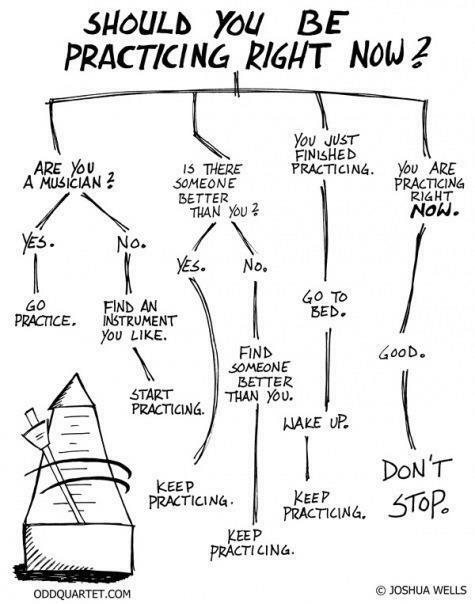 Should you be practising right now? My students are very familiar with this chart, which sits on the chest of drawers next to the piano. A colleague of mine has it pinned on the door of her piano room, and I should think innumerable other music teachers and students have it somewhere to remind and inspire. Remember – regular practice WORKS! With students returning from the half-term break, this seems as good a time as any to reiterate the benefits of regular, focussed practising. And why? Because regular practice ensures noticeable progression in learning and attainment; it trains the muscular memory which aids accuracy; and it helps to develop note-reading skills and musical understanding. Students who come to their lessons unprepared (i.e. they have not practiced between lessons) can often find the lesson a frustrating experience as they have to go over last week’s work again. It can also be unrewarding for the teacher if a student persistently fails to practice. Even if you only have 10 minutes spare, do your practising and learn, with your teacher’s help, to pinpoint which aspects of your pieces need the most attention. This way you will get the most out of the time you have and you will see definite improvements. And remember, regular practising (at least five days out of seven) is far better than a lot the night before the lesson. Having upped my practice time to around 2 hours per day, 6 days a week, in order to complete the work for my Diploma, I can confirm the benefits of regular practice. I learn new music more far quickly now, and have learnt how to practice deeply and intelligently in the time allocated. Keeping a practice diary is also a useful way of tracking your progress, and for keeping notes of what needs to be done. Now, if you should be practising right now, stop reading this article and get to the piano! Previous postPractice like it’s a Chopin Nocturne…. Next postWhy do a music festival?